The Office of Student Transition Programs invites you to attend Family Palooza (formerly known as Family Weekend), a campus-wide celebration in honor of parents, grandparents, and all extended family. Whether you live near or far, we want you to join your John Jay student for a weekend to discover more about our culture, the community's academic excellence and the energy of our vibrant campus. It's also a great opportunity to reconnect with your student to see first-hand what their life is like at John Jay College of Criminal Justice. All participants must register to attend. John Jay College of Criminal Justice recognizes the vital role parents and family members play in the academic success of their students. Because family members are a very important part of the campus community, we make every effort to promote family communication and involvement. Whether you are family members of new or returning students, we hope your experience with John Jay is positive and rewarding. All family members wishing to attend any or all of the Family Weekend activities must purchase their ticket; this also includes siblings and the John Jay student. Please note that space is limited, so we suggest purchasing as soon as possible. To purchase, click HERE. 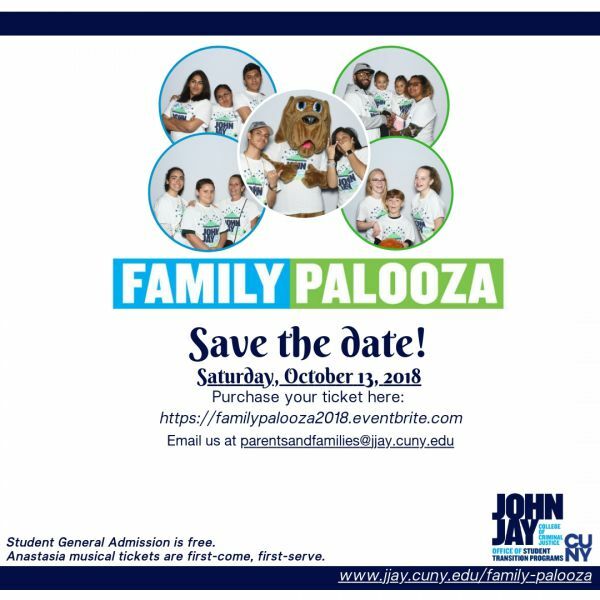 Family Palooza will take place on Saturday, October 13, 2018 from 11am to 5pm at John Jay College of Criminal Justice, 524 West 59th. Street, New York, NY, 10019. Check in will take place in the atrium at 10am.